Legend is arguably the most exciting young Angus bull raised to date at Ohlde Cattle Co. We consider him to be virtually flawless phenotypically. Everyone who has seen him has liked him. Raised on a first calf heifer, his individual performance is also impressive--his actual birth weight was 64 pounds (ratio 88) and he posted a ratio of 107 for both weaning and yearling weight. Legend's pedigree is stacked with many of our most influential foundation cow families. Obviously the great Dixie Erica of C H 1019 cow appears prominently as the dam of his sire OCC Emblazon 854E. His maternal grandsire, OCC Gladiator 612G, is out of the impressive Pathfinder cow OCC Revolution Rose 748E. She is a GDAR Traveler 7111 daughter out of the Revolution Rose of R R 9239, the dam of OCC Backstop 888B and OCC Broadside 876B. Legend's maternal granddam, OCC Blackbird 824G, is a beautiful OCC Anchor 771A daughter out of the powerful PAPA Durabull sired cow OCC Blackbird 778A that sold for $18,600 in our 1998 female sale. 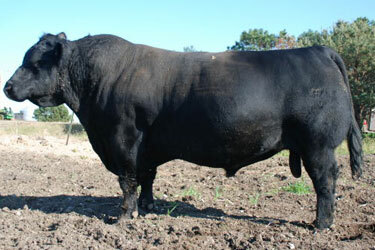 "778A" is an own daughter of the foundation Pathfinder cow Blackbird of R R 1204. We used Legend heavily in our breeding program this past spring and summer. We have never been more optimistic about a young sire!